Bed bugs have become a hot topic in healthcare and group living environments – and for good reason. Bed bugs are difficult to detect and are easily carried in by unsuspecting humans who may harbor the pests in clothes, luggage or personal items. Once they’ve set up shop in your facility, getting rid of them is full of challenges. Pesticides have been found to be largely useless. A variety of non-chemical methods have been tested and found to be effective but no bed bug management eradication plan is quick or easy. Once in your facility, bed bugs hide in obscure place including flooring, base boards, and electrical outlets – anywhere there is a tight hiding space. 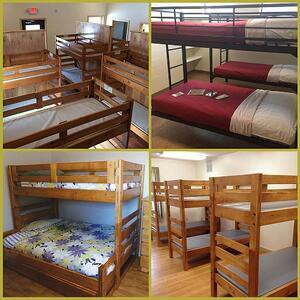 Furniture is an obvious concern since beds and seating offer a hospitable environment for bed bugs. But remember No “type” of furniture is immune to the risks of bed bugs. Facility managers may weigh the advantages of metal versus wood versus metal but at the end of the day no furniture or fixture type can prevent bed bugs. Their small size and stealthy behavior makes them tricky foes. So what can you do when purchasing new furniture to help minimize the risk of encouraging bed bugs? WOOD. The term “wood” furniture encompasses a variety of constructions including solid wood, veneers, composites, and laminates. In general, the smoother the surface the more resistant it is to bed bugs. Wood is not an attractant to bed bugs; rather the porous nature of unfinished or roughly finished areas can offer bed bug hiding places. The more smooth and scratch resistant the furniture finish on all areas of the furniture, the more inherently bed bug resistant a piece is. A well-lacquered piece of solid wood furniture can work well in a bed bug management plan. METAL. Metal beds and case pieces have become a popular option for facilities with a high risk of bed bugs like transient housing. Metal, like finished wood, resists bed bugs due to its smooth finish but still has joints, bends and weld points that can offer bed bugs safe harbor. An advantage of metal is that it resists chemical damage and can be “washed” clean after bed bug treatments. MOLDED PLASTIC. 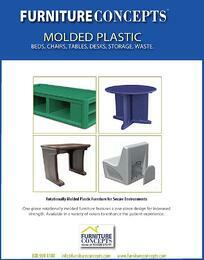 Thermoplastic injection molded furniture is a single piece construction. Molded plastic offers a smooth surface that resists bed bugs. There are fewer joints then wood or metal furniture but there is still surface area on the underside of the furniture that can be a nesting area for bed bugs. Again, plastic can be “washed” after chemical treatments. Although the construction material matters, it is by no means the end of the road for bed bugs. Bed bug infestations involve entire rooms and bed bugs can live happily in small spaces beyond furniture. All furniture has some sort of bend, or crevice, or joint, or surface that meets the floor and wall. Prevention and monitoring will always be the most important part of any bed bug management plan. When in doubt, count on the expertise from your commercial furniture vendor who can help guide you to the right furniture choices that will help you manage bed bugs at your facility.